Traditional iftar items of Old Dhaka attracted huge crowd at an iftar bazar at International Convention City Bashundhara (ICCB) in the capital. 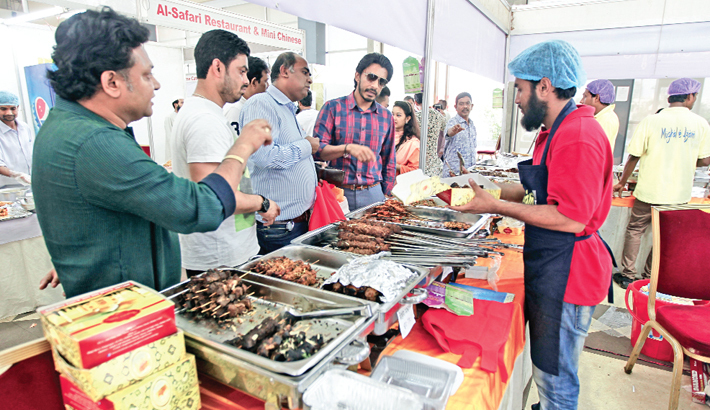 Food-loving people of the city crowd at Hall-1 of the ICCB in the capital’s Zoar Shahara area, also known as 300-feet area, to buy traditional iftar from a wide variety of items. On Tuesday after noon, this correspondent found that people have special attraction on halim (special item with meat and pulse), beef items and foreign desert items. Alongside the old town menu, Arabian desert items including — Mahlabia, Kunafa, Baklaba and Rabani – are also available at the iftar bazar. “We are very much fond of Old Dhaka iftar items. Today we have arranged a iftar get-together and preferred to pick the iftar items from ICCB iftar bazar as many food outlets are serving fabulous menus here under one roof,” said Prof Mohammad Dulal, who came to buy iftar items at ICCB from the city’s Jatrabari area. The traders of ICCB iftar bazar seem happy as most of the items are being sold by 6:00pm. As the customers are confident about the hygiene issue of the ICCB, they prefer ‘kebab’ items from the bazar, said Md Fuadh Saki, chairman of the Mughal-e-Azam food. Saki also said that the iftar bazaar got special crowd today (Tuesday) as an examination under British Council was held in the ICCB. There was found a crowd at the Al Safari food outlet for their specialised ‘Bombay Zilapee’ which is around 700 gram per piece, the item was sold at Tk 400 per kilogram. Istiaq Ahmed, a student of American International University Bangladesh, came to ICCB to enjoy the old town flavor at ICCB. “We always made get-together at 300 feet with friends. However, during Ramadan, we came to ICCB to taste the traditional food at affordable price. Its good to see that there is also sitting arrangement for taking iftar,” Ahmed shared his experience at iftar bazaar. Besides, all traditional food stalls, Baba Rafi, an eatery venture of Bashundhara Group, brought three special items as iftar menu. “We have three combo menus of Burger and kebab for the iftar. The students prefer the items as their favorite brand,” Mohammad Rabbi, a team member of Baba Rafi, said while talking to the correspondent. There was found a special stall of plastic goods which experienced good knock to carry iftar menu. “People buy iftar items and need containers to carry the foods to home. We get special attractions who know as pure plastic good,” Ferdous Ara, Group Manager of Tupperware, said.